Massive Carbs & Protein for "Hard Gainers"! Nothing quite gives you the motivation to lift a heavy dumbell or tackle a full day of labouring under a baking hot sun than a hefty amount of calories and protein behind your belt. Conversely, nothing quite makes you feel like taking a nap instead of exercising than a low energy and protein intake. This is why products like Balance Massive will always have a place on the shelves of supplement stores. So you might be wondering ... what sets this product apart from every other mass gainer on the market? How about added Glutamine, Creatine, New Zealand whey protein and a larger-than-life 4.5kg tub that you can hook into with zero hesitation! Balance Massive contains 1.5 grams of creatine monohydrate per serve, which is a perfect amount, given that multiple serves may be taken daily. Creatine is required for restoring the phosphocreatine molecule which is found in muscle tissue. This important compound is degraded during exercise, allowing for the regeneration of ATP, or energy. Creatine supplementation may speed up recovery times between sets, and support explosive strength and power, particulaly for exercise lasting less than three minutes1. Creatine taken after exercise saves your body having to create enough, which does take time, or having to rely on dietary intake. Glutamine, another important nutrient, has been demonstrated to increase glycogen synthesis and reduce muscle soreness after exercise, and increase peak torque during training2,3. Peak torque is a measurement of the amount of power that a muscle can generate. And if we have more power ... you guessed it ... we tend to lift more weight, increasing muscle stress, and stimulating more growth. Glutamine is actually a non-essential amino acid, which some call a conditionally-esssential amino acid. The latter term indicates that we may no be able to produce enough of this amino acid under certain physiological conditions to meet our needs. 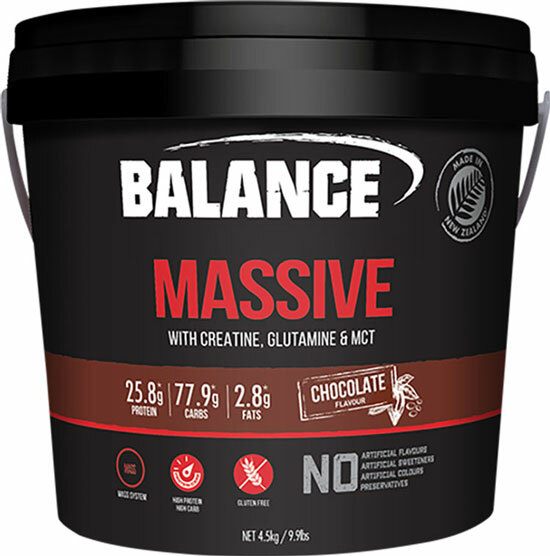 Balance Massive is the perfect companion to a solid training session, or hard day of labouring. It delivers foundational nutrients required for muscle protein synthesis, explosive strength and power, and recovery. Take your training and mass gains to the next level! Shake or blend 3 raised scoops (120g) in 400ml of water or milk. Use Massive up to 3 times per day, between meals or 60-90 minutes before training and/or after exercise. INGREDIENTS: Balance Carbohydrate Blend (Maltodextrin, Glucose Syrup Solids), Balance Protein Blend [Whey Protein Concentrate, Skim Milk Powder, Milk Protein, Emulsifier (Sunflower Lecithin)], Cocoa, Natural Flavours, Creatine Monohydrate, Glutamine, Medium Chain Triglyceride Oil, Natural Sweeteners (Thaumatin, Steviol Glycosides).